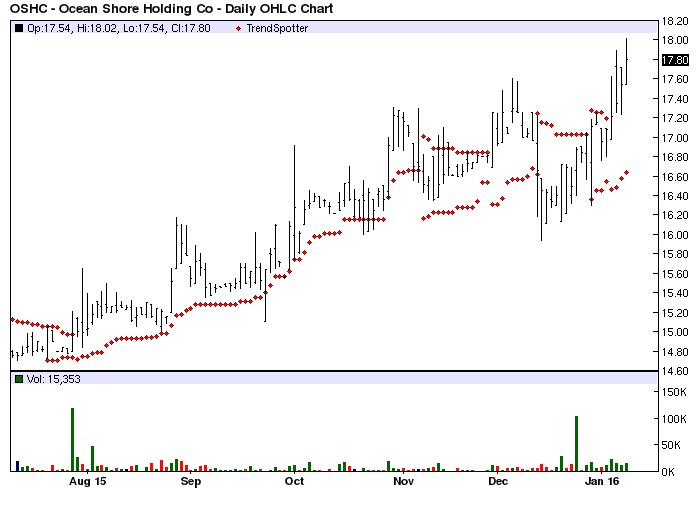 The Chart of the Day is Ocean Shore (OSHC). I found the New Jersey based back stock by using Barchat to sort today's 52 Week High list first for the highest number of new highs in the last month then I used the Flipchart feature to review the charts. Since the Trend Spotter signaled a buy on 12/29 the stock gained 4.03%. Ocean Shore Holding Co. is the holding company for Ocean City Home Bank, a federal savings bank headquartered in Ocean City, New Jersey. The Bank operates a total of six full-service banking offices in southern New Jersey. The 50-100 Day MACD Oscillator has been a reliable technical trading strategy on this stock. Sometimes when a stock has a small following, weak revenue and earnings estimates but continues to rise some merger/acquisition activity may be on the horizon.